Good rainfall in August has turned the situation around for WA wheat growers, who were staring at a potential dramatic fall in yield following a record dry June. Grain Industry Association of Western Australia (GIWA) had reported in July that the WA crop was in a precarious state after lacklustre rainfall, predicting that millions of hectares of wheat, canola and other crops could be wiped off the state production forecast. With the August rainfall, growers are now anticipating better than average yields. Meckering growers Greg and Darren Morrell, who farm in the Kwinana port zone, planted half the available land at their mixed broad acre property Melrose with wheat, and the rest with canola, lupins, barley and chickpeas. Having sowed 100 hectares of Cobra wheat as well as some Mace in the middle of May, the father-and-son team are glad to see a season turnaround. Darren explains that they had about 2.5mm rain in June but conditions have been favourable since August. Mr Morrell recorded their growing season rain at 136mm to the end of August. He commented that the crops were looking good and were at about 50 per cent grain fill. He adds Cobra’s disease package is also working well, showing less Yellow Spot disease than Mace. As part of the bulk-up work the farm does for local businesses, Mr Morrell gets to try new varieties and see how they compare in the field. The growers do seed production on behalf of Seednet and EDSCO (Eastern Districts Seed Cleaning Co), bulking up their new varieties for them, and get anywhere between one tonne and five tonnes of seed each season. 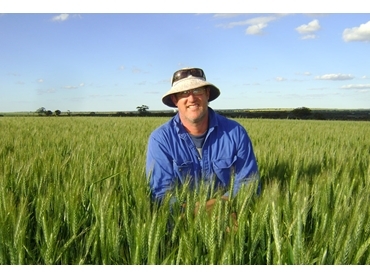 Mr Morrell said for the past three seasons they have been putting AH variety Cobra wheat through its paces, and are pleasantly surprised at what it can do for their yield and protein percentages. In 2011 they had planted Cobra and Mace side by side in the same paddock with the same agronomic elements; the Cobra variety yielded 250kg more with approximately one per cent more protein. He picks out the protein content as the main reason for growing Cobra. Mr Morrell explains that Cobra has an edge over its competitors because it is rated as AH and is a good protein accumulator, giving them the option to upgrade to a higher grade. If their crop can jump to a higher grading like the H2 or AH variety, it translates into more money for them. The Morrells sowed the Cobra at 50kg/ha with 25cm row spacing using a Chamberlain 753 minimum till combine with 9-inch knife points and press wheels. Fertiliser was applied in the form of MAPZCS at 50kg/ha and urea was used at 100kg/ha. A broadleaf radish spray consisting of 900mL of Jaguar and 200mL of LVE MCPA was also used. Darren and Greg are looking to harvest in December and are hoping for a nice balance of yield and protein to get the best possible return on their investment. GIWA’s September report is forecasting that many regions are now set for average-to-above-average yields due to the distribution and amount of rainfall from mid-July. Pacific Seeds has demonstrated its commitment to bringing high quality plant genetics and seed technology to Australia’s farming community.